PART THREE – TRUTH OR SCARE? 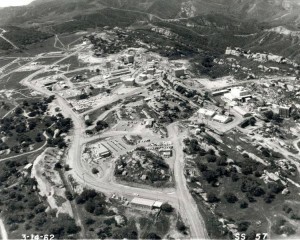 The majority of comments received by California’s Department of Toxic Substances Control (DTSC) supported the 2010 Agreements on Consent (AOCs) to clean up the radiological and chemical contamination at the Department of Energy’s (DOE) and NASA’s leased and owned property at the Santa Susana Field Laboratory (SSFL) to background levels. Overwhelmingly, DTSC said, community members expressed “excitement and support” for the agreements that would see the site restored to its natural, pre-contaminated, condition. The excitement was short-lived. The first sign that the agencies might not be so committed to the cleanup agreements came less than a year later, in July 2011, when NASA announced that its Environmental Impact Statement (EIS) for the SSFL cleanup would examine “alternative” cleanup standards. 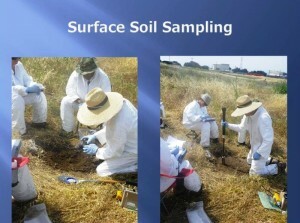 The community was outraged, and called upon DTSC to intervene, which ultimately it did, as did Senator Barbara Boxer and the Council on Environmental Quality, which informed NASA that the National Environmental Policy Act (NEPA) did not, as they had claimed, require them to evaluate lesser cleanup levels. NASA’s draft EIS, released last August, nevertheless did include varying cleanup scenarios. The EIS also contained, without any technical basis, soaring figures about the number of trucks required to remove the contaminated soils and other misleading information. Community members blasted the EIS as a blatant attempt to manipulate the public into opposing the cleanup. They noted that EIS ignored important provisions of the AOC to protect endangered species and Native American artifacts, and included no analysis at all of the witches brew of toxic chemicals on its property and their impact on health. In sum, NASA received thousands of comments from community members and cleanup advocates urging them to keep their commitment to the AOC and explore sensible mitigation measures which were not included in its draft EIS. NASA will issue its final EIS this month, and its Record of Decision shortly thereafter. If it attempts to break out of the AOC cleanup agreement, it will be up to DTSC to take action. As several commenters pointed out, the SSFL cleanup is regulated under the federal Resource Conservation and Recovery Act (RCRA), and the authority to implement and enforce in RCRA in California has been delegated by the US EPA to DTSC. NASA is subject to RCRA and thus to DTSC’s regulatory authority. It has no discretion in determining how much of the contamination it created gets to be cleaned up. DTSC, the regulator, determines cleanup standards and NASA is supposed to comply with its directives or face enforcement action. 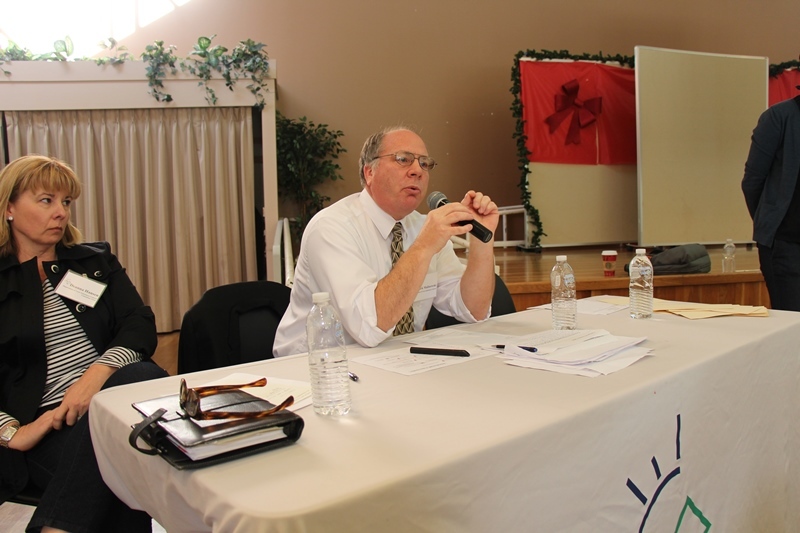 Whether or not DTSC would take such action is uncertain, particularly given what transpired at two DTSC public scoping meetings in the San Fernando and Simi valleys in December. The meetings were held to get public comment on options for cleanup under the California Environmental Quality Act (CEQA) as it begins to prepare its Environmental Impact Report for the entire site, including Boeing’s property. Boeing did not sign an agreement to cleanup to background, and is instead supposed to comply with a weaker 2007 consent order. As many cleanup advocates have noted, according to current law, the land is supposed to be cleaned up to the standard for which it zoned. In Boeing’s case, that would be agricultural, which advocates say is sufficiently health protective. Open space standards, which Boeing wants, would leave most of the contamination untouched. The first meeting was held at Chatsworth High School auditorium. 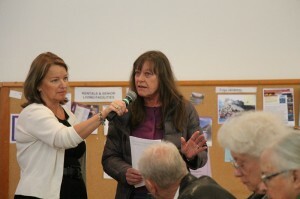 The gathering of nearly 60 people was held by the Department of Toxic Substances Control December 10. As the community has now come to expect, a small but vocal rump group supported by Boeing to fight the Rocketdyne cleanup showed up to proclaim that the contaminated site would be violated anew somehow by being remediated. Bewildering to longtime cleanup advocates, the cleanup naysayers present an ever-expanding list of ever-strange reasons as to why SSFL should remain contaminated. 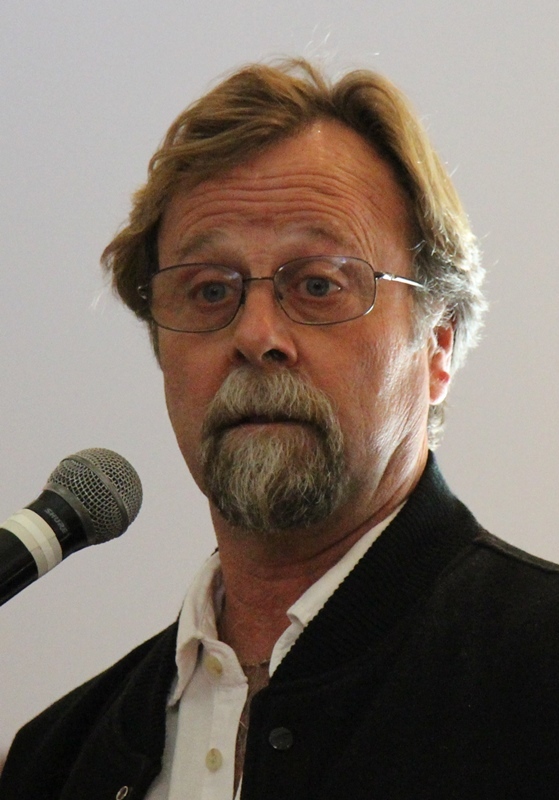 At the Chatsworth meeting, cleanup detractors ventured multiple notions on why one of the most polluted places in the United States shouldn’t be cleaned up to background levels of radiation and chemical contamination. 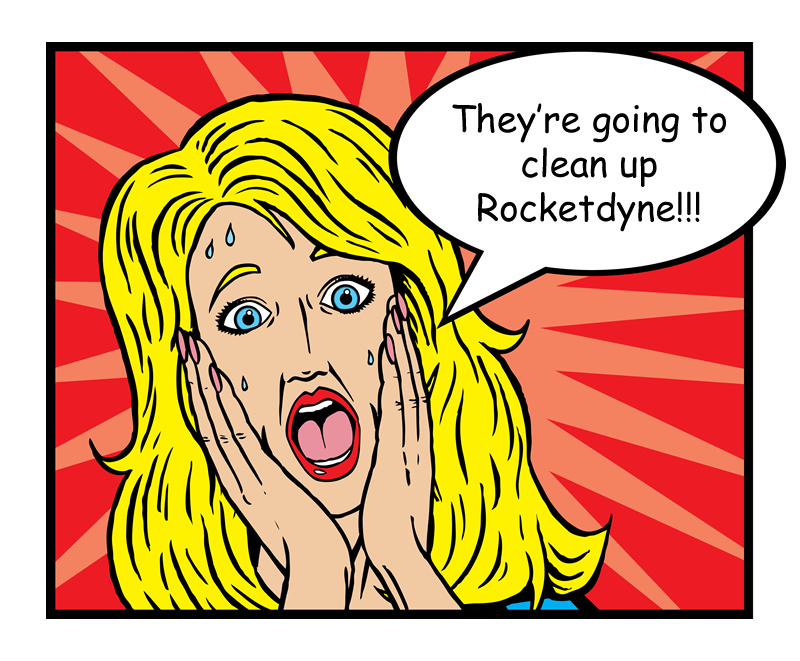 It was suggested by one resident that remediating Rocketdyne to normal levels would encourage development on the site so better the contamination stay in place. Another cleanup adversary offered the novel twist of saying the land was too contaminated to be moved. Still others said it didn’t need to be cleaned up because it wasn’t that badly contaminated at all. With DTSC and Boeing officials in the audience, one San Fernando Valley resident, Dianne Dixon Davis, claimed that a truck would be rolling through her neighborhood every three minutes around the clock for fifteen years. That equals 2,629,745 truckloads in this scary but impossible fantasy scenario. Who are we to believe? A bird-watcher and a nameless EPA official? Or the National Academy of Sciences, which says that no amount of radiation can be said to be harmless, let alone the highly contaminated Santa Susana Field Laboratory. Not to be outdone by his fellow opponents of a full SSFL cleanup, the attorney who represents the casino-owning Santa Ynez Band of the Chumash Indians, Sam Cohen, stood up and read a statement essentially claiming the whole SSFL site for his tribe. Cohen is also on the SSFL Community Advisory Group even though he lives nowhere near the place. 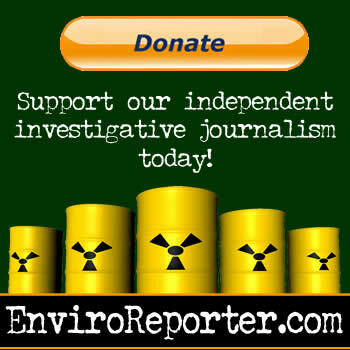 EnviroReporter.com exposed the CAG in Operation Astroturf in December 2012 for being in league with the polluter and government’s anti-cleanup interests. That would suit the polluter and its government enablers just fine because the Santa Ynez Chumash could use their vast resources to engineer land unencumbered by prior cleanup agreements. It could also use its clout to eventually claim no obstacle stands in the tribe’s way of building a huge casino on the sprawling property. It’s not clear whether the tribe could succeed in declaring the entire site sacred and take title of it because the order Cohen cited has to do with government property of which NASA is the only land owner at SSFL. Area IV’s primary tenant has been the Department of Energy as a lessee, which could technically allow the Santa Ynez Chumash access to that part of the lab’s potential sacred places, not title to the land itself. Boeing, however, is the owner of most of the huge Rocketdyne site so its holdings wouldn’t fall under Executive Order 13007 which seems narrower in scope than perhaps Cohen envisioned. The physical integrity of much of SSFL has been impacted by massive earth moving, rocket test stands, 30,000 rocket tests, a huge nuclear complex with a Hot Lab and Fuel Fabrication Facility, multiple dumps and polluted pools filled with exotic and lethal chemicals. It is unlikely that access to these places is what any religious practitioner is looking for. 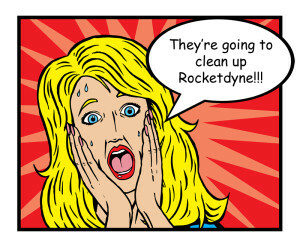 Cleanup opponents claim that remediating the 2,850 acre property would somehow disturb Native American artifacts, conveniently overlooking that after over half a century of major aerospace, nuclear and defense industry operations, Rocketdyne isn’t even remotely the same as it was before the first Nazi rocket test stand was carved out of the once pristine hills. Von Braun’s playground, laced with invisible poisons, exudes a dark Outer Limits aura not easily erased by exuberant birders or archaeologists looking for arrowheads. However, cleaning the lab’s contamination to background levels would be an essential step in restoring the ‘sacredness’ of the site, if such a thing can be done. And the AOCs carry an explicit provision for protecting Native American artifacts on the site.